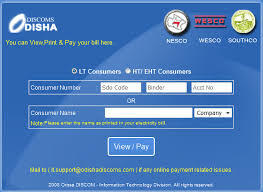 Hello readers today i gonna to tell you how can you pay electricity bill payment in odisha online. Till now most of the bill payment of electricity in odisha is paid on offline mode. But as per technology is developing day by day so you can Pay your electricity bill online without any issue in odisha too. 1) Any user of WESCO , NESCO and SOUTHCO can pay the bill directly from the odisadiscoms website. -- Then select the consumer name -- Enter amount of bill you want to pay. -- You will get all your bill details and on the right side of the page you get the options to pay which includes. It takes usually 3 working days from the date of bill payment to refelct to your account. After paying online if your bill due amount will be deducted at the same time so wait for 3 days for the due amount to be detected.